McAllister Towing is one of the oldest and largest marine towing and transportation companies in the United States. 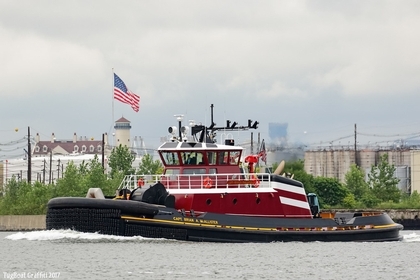 They operate a fleet of more than seventy tugboats and twelve barges along the East Coast from Portland, Maine to San Juan, Puerto Rico. Although their corporate headquarters are located in New York City they operates in the ports of: Portland Maine, Staten Island New York, Philadelphia, Pennsylvania; Baltimore, Maryland; Hampton Roads, Virginia; Wilmington North Carolina, Georgetown, and Charleston, South Carolina as well as Jacksonville, and Port Everglades, Florida; including San Juan Puerto Rico. McAllister engages in ship docking, general harbor towing, coastal towing and bulk transportation. Captain James McAllister started the first McAllister enterprise shortly after he arrived from Cushendall, County Antrim, Ireland. Together with his brothers and in-laws, McAllister formed the Greenpoint Lighterage Company. They augmented the lighterage business with towing, with the acquisition of their first steam tug, the R.W. Burke, in the 1880's, while the Brooklyn Bridge was still being built. In the early twentieth century there was a period of innovation and expansion. Captain James was one of the first to convert a sail lighter into a bulk oil carrier, for the transport of oil around New York Harbor. The company also became known nationally for its salvage work, which extended from the West Indies, along the Atlantic Coast as far north as Maine. In 1909, the company acquired the Starin Fleet of steamboat excursion vessels, forming the McAllister Steamboat Company, which was then among the largest excursion boat operators in New York, with regular runs to the Statue of Liberty, Bear Mountain, Coney Island, and Long Island. After the death of Captain James in 1916, his four sons assumed control of the company. The new partnership consisted of James, John E., Charles D. and William H., the second generation of McAllisters. By 1918, the company had moved into the ocean towing business. McAllister inaugurated one of the first deep-sea tug-barge combination with the 156 foot long tugboat, C.W. Morse, carrying molasses from Cuba to New Orleans. 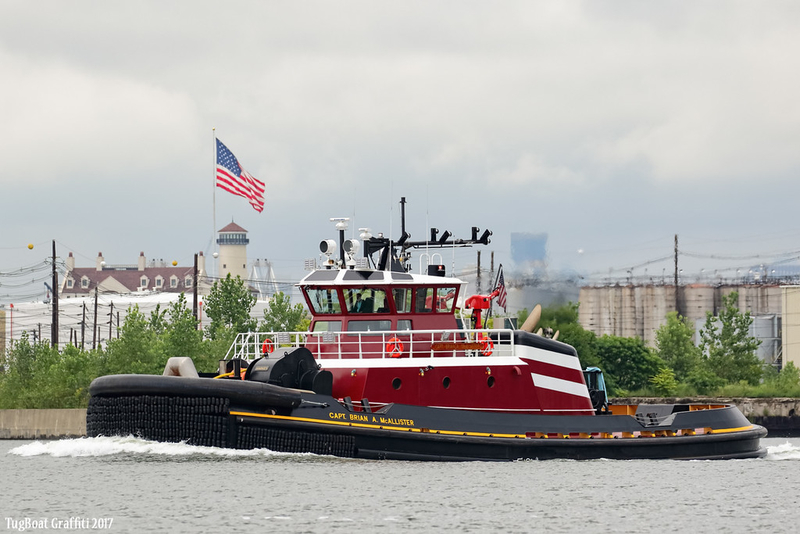 Always an innovator, in 1927 McAllister installed a 375 horsepower diesel engine into the Daniel McAllister, making it the first diesel powered tug in New York Harbor. During the First World War, James McAllister served on the Board of Embarkation for the U.S. Government. He also held the post of Acting Director for the Army's floating equipment. Between the Wars, a fleet of twenty ocean going tankers was operated by McAllister to all parts of the world for the U.S. Shipping Board. With the death of James McAllister in 1936, the third generation of McAllisters assumed control of the company. Anthony, James, and Gerard McAllister are credited with maintaing the company's stability through the Great Depression. They also brought the company to its present-day prominence. During the 1940's and 1950's, the company expanded to include operations in Pennsylvania, Virginia, and Canada. Today, those operations have expanded to include offices in Portland Maine, Baltimore Maryland, Wilmington North Carolina, Georgetown South Carolina, Charleston South Carolina, Jacksonville Florida, Port Everglades, Florida and San Juan, Puerto Rico. In recent times McAllister helped pioneer the development of the Kort Nozzle, Flanking Rudder steering systems aboard tugboats.